We recommend checking out our discussion threads on the Amped Wireless High Power AC1750 Wi-Fi Router RTA1750, which address similar problems with connecting and setting up Wireless Routers Amped Wireless. The user manual for the Amped Wireless High Power AC1750 Wi-Fi Router RTA1750 provides necessary instructions for the proper use of the product Computers & Solutions - Networking - Wireless Routers. 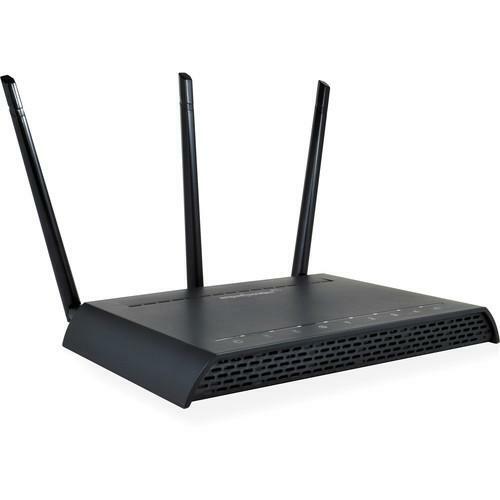 The High Power AC1750 Wi-Fi Router from Amped Wireless features twelve amplifiers, three high-powered antennas, and 802.11ac speeds that allow you to connect at home or work with multiple devices in different rooms and share different types of media at any time with no lag. With these features, the signal from the router is able to penetrate through walls to eliminate Wi-Fi dead spots. Armed with 802.11ac Wi-Fi technology, the router can provide 450 Mbps 2.4 GHz connections and up to 1300 Mbps 5 GHz connections, simultaneously. Furthermore, it delivers security features that include setting the exact days and times the network is active, control how far the Wi-Fi signal reaches, and only allow specific devices to access the network. You can also create up to eight additional Wi-Fi networks for guests and create secure connections with WPS configuration. This router is built with four Ethernet ports that provide wired gigabit speeds to your computer, smart TV, gaming consoles, and more. When you want to share information on an external USB storage drive, simply connect the drive to the USB port on the router so that you can access the contents from all devices connected within the network. In addition, this router lets you access the USB drive via a FTP client when you are not at home. Setup is simple with the Basic Setup Wizard that guides you through the setup process and automatically configures the settings of your Internet provider. Taking only minutes, your Wi-Fi network will be up and running quickly as well as reach farther areas. Included with the router are a power adapter, Ethernet cable, and an installation video CD. If you own a Amped Wireless wireless routers and have a user manual in electronic form, you can upload it to this website using the link on the right side of the screen. Box Dimensions (LxWxH) 11.9 x 9.3 x 3.6"
The user manual for the Amped Wireless High Power AC1750 Wi-Fi Router RTA1750 can be downloaded in .pdf format if it did not come with your new wireless routers, although the seller is required to supply one. It is also quite common that customers throw out the user manual with the box, or put the CD away somewhere and then can’t find it. That’s why we and other Amped Wireless users keep a unique electronic library for Amped Wireless wireless routerss, where you can use our link to download the user manual for the Amped Wireless High Power AC1750 Wi-Fi Router RTA1750. The user manual lists all of the functions of the Amped Wireless High Power AC1750 Wi-Fi Router RTA1750, all the basic and advanced features and tells you how to use the wireless routers. The manual also provides troubleshooting for common problems. Even greater detail is provided by the service manual, which is not typically shipped with the product, but which can often be downloaded from Amped Wireless service. If you want to help expand our database, you can upload a link to this website to download a user manual or service manual, ideally in .pdf format. These pages are created by you – users of the Amped Wireless High Power AC1750 Wi-Fi Router RTA1750. User manuals are also available on the Amped Wireless website under Computers & Solutions - Networking - Wireless Routers.